Everyone knows your kids are cute and therefore they are constantly buying your cute kids toys. And then some more toys. So when it comes time for mom and dad (or Santa – hey you never know) to get them something well, there isn’t much left. This year I’m working really hard to give my kids more global gifts. M has lately developed a real interest in the world and ahem takes after his mom. Who am I to argue? K is in love with animals, all of them, but especially pandas because “they live in China and eat bamboo” (his words not mine). So I thought I would share my top 10 favorite gift ideas for global kids. 1. Geosafari Talking Globe Every little adventurer needs a globe to learn where they’re going. I like this one because it’s a great learning resource and it’s fun. It teaches basics of geography and mixes in quizzes to keep kids on their toes. 2. A Child’s Introduction to the World . I love the watercolor illustrations in this book as well as the more advanced level. 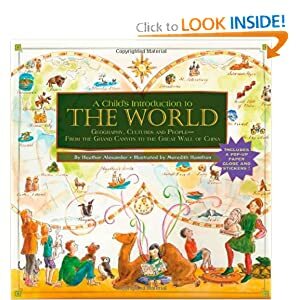 This book is for kids aged 9-12 it starts with the basics—hemispheres, latitude and longitude, continental drift, map notation, landforms, population density, and more—the book gives kids a solid foundation to begin exploring world geography. Each section profiles a different continent, including climates and biomes (tundra, grasslands, etc. ), mountain ranges and bodies of water, people and cultures, governments and industries, wildlife, and much more. And sidebars throughout offer biographies of explorers, fun facts, and projects kids can do with parents or on their own. 3. 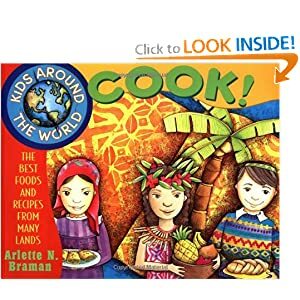 Kids Around The World Cook It should come as no surprise that I would recommend a cookbook for kids that is global. I have found that the more children are exposed to different kids of food the more open their eyes are to the world. Food is memorable and being able to tie new foods with learning about different parts of the world will stick with your child. I can vividly remember the first time I tried unique global foods and I hope my children will be able to do the same. This book is really a gift for the entire family! 4. Hartlyn Kids books. I just got our first book from Hartlyn Kids and I found it really beautiful. I am making continent bags for gifts this year. I purchased the India book and plan to include it with a bag I am making about the Middle East and South East Asia. There are two books currently available and I recommend both of them! 5. Little Passports. Lately I’ve been really looking into curated monthly subscription boxes – I’ve got a few coming my way to review (so you’ll be seeing them soon). A while ago I got a Little Passports subscription for my boys. We received several months but ended up canceling as we just weren’t having time to really use it effectively. I’ve been thinking about re-starting it and I think you would like it also. It works like other curated boxes except it’s for kids between 5 and 10. Each month a box shows up focusing on a country with goodies inside about or related to that place. It’s really very cool! There are 4 subscription levels available but what better gift than something that shows up as a surprise every month? language VCR tapes. I wanted one so bad. (They are still around). However, I’ve found Little Pim and would LOVE to get these DVD’s for my boys. The best part..they have Arabic!!! In the gift sets there is an intro set and a gift set. You can also buy the DVD’s individually, a digital version and teacher’s guides. They are really reasonably priced. I wish I could give you a better review of the product but I haven’t actually tried them yet. I love the concept and appreciate that they exist in Arabic. They also have free shipping during the month of December – love free shipping! 7. National Geographic. It doesn’t get much more classic than Nat Geo. It’s a huge favorite here not only for me but both of my kids. They will watch the National Geographic channel or online videos for hours. (This mom thinks that’s pretty awesome!) They have subscription options available for the classic magazine, National Geographic Kids and National Geographic Little Kids. My 4 year old gets the Little Kids magazine and he and his big brother sit down and read it together every month. I got the classic magazine and they both love looking at all of the pictures. A very educational but fun gift for kids 3+. products any family who travels would enjoy. My kids are always stealing our neck pillows because when we travel their pillow pets are just too big and not comfortable for using when stuck in a seat. I love these soft neck pillows with tons of different animals to choose from. The adventure logs look like passport bags but have plenty inside to keep kids busy. Some of these things include; notepad, tracing paper, colored pencils, writing pencil, games and activities, magnifying glass and more. 10. Donation. Some of my favorite organizations are Heifer International, UNICEF, charity:water and Islamic Relief. This can be a great part of a gift to a child. It might be a great activity to do together. Select a few organizations and then talk about each of them with your child, allowing the child to “spend” a certain amount of their gift on one organization or spread the money out to all of them. Most organizations tell you what specific amounts of money can do – let your child know this as you talk about the organizations. I think this is a great way to teach children about charity and helping others. 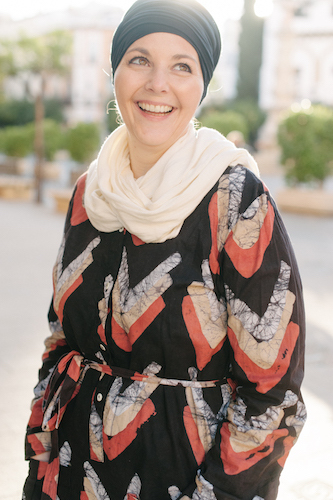 It can spin off and continue to be a topic throughout the year, learning about the place where the money has gone and possibly even having contact with the person or community that has benefited. Glad you made it through! I would love to know some of your favorite gift ideas for global kids! Watch next week when I’ll be posting my top 10 gifts for Morocco-philes! I love this list. Totally sharing! All your ideas are very good! I love Nat Geo! If I had extra money I would deff get a subscription (but there are so many other thin gs I want to get a subscription to: Islamic Horizons (ISNA) The Message, The Budget, Ladie’s Home Journal (written by AMish and plain women) and a bunch of others! I also love the idea of donating in their name. That is a very very good idea. Maybe u could buy an animal from Heifer in K’s name and let him help pick out the animal or share of an animal? Yup that’s what we’re going to do – I think he’ll be so excited. What a great list! 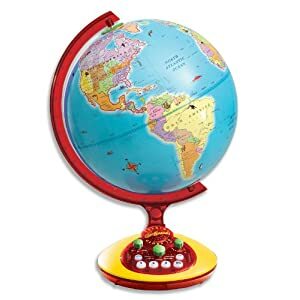 I’ve been looking for a globe for my son and I know he would love this. I just discovered your site through a link with Hartlyn Kids. So glad to meet you as I am a grandma of eight…two who will benefit from the information I found here! That’s great! So happy to have you visit – I hope you’ll come back again and the kids love their gifts! I love connecting people! Aqueelah is great! This is such an awesome list and we are delighted and honored to be included! I see some things that I need to include as gifts for my little one!